While working as a journalist in downtown Kenosha for many years, I engaged in numerous conversations about what would be good or bad for the old central business district. I also listened to many presentations from experts on downtown revitalization. The two people who made the most sense about what would be effective both said essentially the same thing: Nurture the artistic community. John Cram was one of them. Cram, originally from Kenosha, operates art galleries and a movie theater in Asheville, N.C., and has been credited with helping to revive Asheville’s downtown. That’s one of the reasons he was honored with the North Carolina Award for Fine Arts in 2013. That was a little bit surprising to me. I had thought that it takes an economically thriving community to support an arts community. The consultant opened my eyes to the possibility of the connection working the other way — a thriving arts community creating economic development. Why successful revitalization efforts start with the arts community, I’m not sure. Perhaps it’s as simple as the artists – actors, painters, photographers, writers, gallery operators and others – tending to be energetic. Their energy is attractive, and it draws others who also tend to be energetic, and as people get together they create a social gravitational field. That kind of attractive power draws businesses. Look at how many more eating establishments are in the downtown and Harborside areas of Kenosha now compared with just a few years ago. What drew them? No big employers with lots of potential customers moved downtown. Art galleries, such as Revision, and performance spaces, such as Fusion, moved in. Those enterprises bring in people, and the people attract coffee shops and restaurants. Then come bakeries, candy stores, exercise studios, and salons. In turn, the shops and restaurants attract people to the galleries and performances. Each success leads to more success. 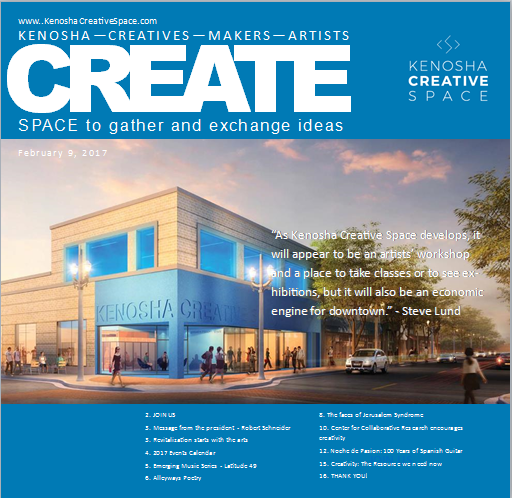 Kenosha Creative Space expects to play a vital role in nurturing the artisitic community. It will be a place where creative people can work as well as exhibit their work. It will be a hub where creative people can connect and work together, drawing inspiration from each other. As Kenosha Creative Space develops, it will appear to be an artists’ workshop and a place to take classes or to see exhibitions, but it will also be an economic engine for downtown. Steve Lund, a freelance journalist, is the former editorial page editor of the Kenosha News.